Strong and yet as delicate as a bird. Her first memory is of being held on the shoulders of her father and watching American troops parade down Main Street in Fargo, North Dakota, on their return from the First World War sometime in what must have been the late Spring (Maybe May) of 1919. She's been a student of Moorhead State Teachers College and is now their oldest alumni. A class reunion is anywhere she is and at anytime she decides to have it. She still reads the alumni magazine. In fact she still reads The Saturday Evening Post, having been a subscriber since 1943. "It's a very interesting magazine. Not as important as it once was, but still with a good variety to its articles." She's taught school in everything from a one room, multi-grade school in Lake of the Woods, Minnesota to the modern modular buildings of Chico Country Day. At that school she put in 6,000 hours of reading classics such as Black Beauty and Treasure Island to generations of children. She married her husband and lived with him for over 30 years until he died in 1972. Since then there has never been another man in her life. She raised three sons of her own. All of whom had pretty good lives and none of whom came to any more bad passages than life ordinarily deals everyone. 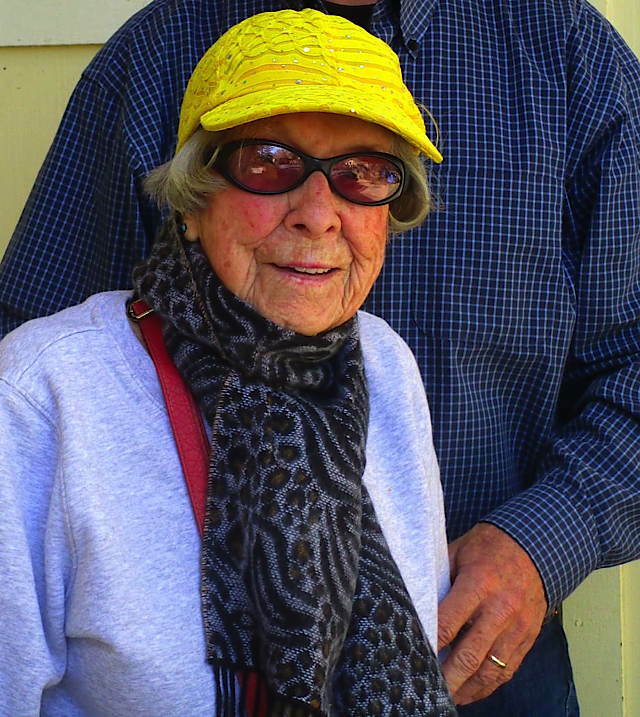 Last November she celebrated her 102nd birthday and again I discovered at her party that she has more friends just in the town of Chico, California than I know people in the entire world. Thirty-seven thousand and three hundred and eighty days. Every minute is worth a priceless gem." Hold her tight, it is terrible when you cannot anymore. God bless her. May the Lord bless and keep your Mother and you. A wonderful tribute to a remarkable Mother by a loving son. Best wishes for you both on Mother's Day. The Grace of God is upon you and your mother. Thank you for sharing the joy with us. Happy Mothers Day to her, best wishes. Thank you for sharing her with us as you do. A wonderful and inspiring life! Enjoy this one and hope for one more. Then one more. Time speeds up way to fast as we age. I wish her and you well. Fantastic! I wish you both a great day. God bless her Gerard. Happy Mothers day to all the moms out there. Thank you as always, Gerard, for this site and the relief of some sanity in this world. May she have a very blessed day. And give her our thanks for the Sacred Cookie recipe, which is a favorite in my house. How wonderful....all the best to you both on Mother's Day! She's a cutie! You are blessed my friend. What the other folks said, Gerard. I can't add anything. But I guess I will, anyway. God bless her, and consider yourself a lucky man. Happy Mother's Day to your dear mother. Even for all that she is, above and alone from the fact of her motherhood, you and your brothers are still her proudest accomplishment, her greatest blessing, her deepest joy. Never doubt it. I've been an orphan since my early forties, you never really get over it. Nice to see others having parents into their "old" age. Cheers. I'm crazy about your darling Mom. Bless her---bless you. Talk to her every day---because apparently no phone company ever made the cut for heaven. What a gift! A life in full is to be cherished. Let us now praise precious women, especially those praiseworthy for their humanity. We are blessed in living in their company and them in our memory. Wow, she is the original energizer bunny. You have been blessed. I was hoping you would give us the opportunity to celebrate her this year. Thank you. Happy Mothers Day Mrs. Vanderleun. Happy Mothers Day. So pleased to see Mrs. Vanderleun again this year! Happy Mother's Day, Mrs. Vanderleun. And I've said it before, Gerard, and I'll say it again -- you're a lucky man. Happy Mother's Day to your beautiful mom. Thank her for us for her contribution of an interesting son into our midst. As your posts unfailingly remind us, she done good. My mother was born a few years before yours, and died many years ago. I miss her very much. Best wishes to both of you.